Plan early! We suggest you begin planning for your group six to eight months in advance and no less than two months in advance. This will assure that we can create the best program for your group with dates and locations you desire. CFI takes pride in helping you select a School or Youth Program that best suits your group size, educational goals, time frame, and budget. Call CFI to discuss the best options for your group. We are here to assist you! Below is information you'll need to begin planning your school’s program. We are here to assist you with the planning process, and this checklist will help you get started. Look through our program options. We have a variety of programs on both river and land designed to accommodate many different schools and groups. Here you can get an idea of what will work for your group. Estimate your group’s size. You can refer to our School Program descriptions for group size limits on all trips. Decide on a range of preferred dates. Some dates fill early. Many stretches of river have limited launch dates and public lands have seasonal use limits. Determine your overall budget. This should include program cost, your travel costs, and chaperone fees. Select a river or land program. CFI can help you fulfill your teaching goals specific to your age group needs. Carefully read about Deposits and Payments in the next section below. Decide on one program or more and review your choices with parents and school administration. We will provide information on permits, risk management program, sample registration/risk forms, insurance, and references. Please note: CFI chooses to operate on nature’s terms, “unplugged” in the backcountry, without cell phones or other electronic devices. We offer traditional wilderness experiences and rely on preparedness, training, backcountry skills, and wise leadership. Be sure to have your administration’s approval prior to confirming your reservation. Confirm your program with CFI. We will send you an invoice for the non-refundable deposit, as well as contract by email. Please respond with a deposit payment by credit card within 30 days. Your dates are tentative until the deposit payment and the signed contract are received. Make your transportation plans to our area. Be sure you know exact dates for travel to match with your CFI program. CFI will send you a program brochure, gear list, behavioral guidelines, and registration and risk forms for all teachers, students, and chaperones attending the program. These are for parents information as well. Your packet will also contain curriculum objectives, program schedule, and a map to our area. On your contract, note due dates for final numbers of participants and for payments. Timely receipt of payments is required and a final number of participants is necessary for planning. Start preparing your students for their Land or River Education adventure. Get them excited to come, and tie curriculum to your destination. Schedule a pre-trip meeting with parents and students, review clothing and gear lists and practice setting up your tents if you are bringing your own. A CFI naturalist-guide that will be with your group in the field will contact you several weeks prior to your trip by email or phone to firm up details, discuss any student health, diet or behavioral concerns, and work with you to insure your students to have a safe, fun, and “transformative” field trip experience. To secure your reservation we require a non-refundable deposit equal to five student fees. Once you decide on a program, we will send out an invoice and contract. This deposit is due within 30 days. Upon receipt of your deposit, we will send program materials and participant registrations. Final payment is due 30 days prior to the programs start date. For reservations made less than 60 days out, we request final numbers at the time of reservation. Payment may be made by credit card or check and are due within 10 days of invoicing to secure the reservation. Each CFI required teacher/chaperone receives 50% off. BLM special use fees still apply to all adults. No more than six adults with each school group. On land programs, we require one chaperone per 12 students. On river programs, we require at least two chaperones per group. CFI offers several discounts for School and Youth Programs. To secure the dates that you want and to obtain our Early Bird Discount, we encourage you to act soon as our calendar fills quickly, especially for May and September of each year. All required chaperones receive a 50% discount. See Adult Fees and Policies. CFI Offers Scholarships for School and Youth Programs and Summer Camps. Additional scholarship/discount is available to K-12 public schools and Indian Reservation Charter Schools. Scholarship Application for Public Schools (pdf). There is a scholarship fund developed each year through annual fund giving at CFI and thus a cap exists on the total amount that can be awarded for this school year; so please apply early! The awards are based on the percent of the school's student body enrolled in the Federal Free & Reduced Lunch (FRL) program (not just students on this field trip). If 51% or more, then 15% discount. You are asked to provide documentation of the FRL rate on your scholarship application. Scholarship assistance is available for our summer camps. Please contact CFI for more information and we will send you a form. Our school programs vary so please check each type of trip as to what type of transportation is included. Additional bus services can be hired with notice. You arrange transportation to our camp or river launch site or trailhead. CFI fees listed for multi-day river trips cover shuttle of two school vehicles or a hired bus to transport your entire group back to the launch point. Additional school vehicles can be shuttled for $100/vehicle. For a single day river trip near Moab, CFI works with your drivers to shuttle all vehicles, included in fee. For your own travel planning, see the Moab Travel Council pages for camping, accommodations, and transportation. Furthermore, if you plan on camping before or after your trip BLM group sites are now available up to one year in advance. Our general cancellation policy is outlined here but each school contract will have a cancellation clause tailored to meet the specifics of that trip. CFI has developed the following policies based on the nature of our business. Please note that we base our operations on your reservations and pay for services accordingly. Please take your reservation seriously. Since we work with small participant groups, secure services in small, rural towns, and schedule our staff, equipment, and food purchasing far in advance, we have a limited number of seats and dates. Please make every effort to give accurate numbers for your program, and arrive for the program on-time once you have registered. Notify us of cancellation in writing by email in addition to calling us at the CFI Office; we check our answering machine regularly when the office is closed. Please note that our staff does not carry cell or satellite phones and cannot be reached during a trip. If you cancel, any gear rental fees paid to CFI are non-refundable and non-transferable. CFI reserves the right, in its sole discretion, to alter the itinerary or location or even cancel a trip, for reasons including but not limited to weather, water fluctuations, insufficient reservations, and other factors. If CFI cancels a program, your money will be refunded. If CFI alters a program, your money will be refunded if you choose not to attend the altered program. However, CFI is only responsible for the actual amount paid by you directly to us and is not responsible for any other costs incurred by you, in relation to a program that is altered or canceled. Please see section 8 below for Travel Insurance. CFI highly recommends that participants purchase travel and flight insurance coverage to protect your program fee, airline, and other trip costs. Our public lands and river permits limit group size for our locations;. If you have a group of over 60 students for our Professor Valley Field Camp programs or over 25 participants for river programs, please inquire how CFI can accommodate you through simultaneous trips in different locations, sequential programs, or simultaneous programs. 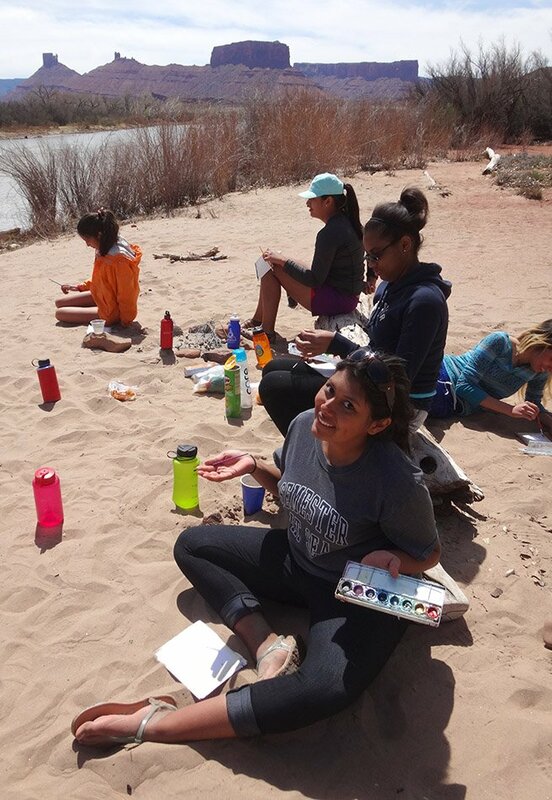 Our Cisco to Professor Valley two night Colorado River Program accommodates groups with up to 45 participants. We request final numbers 30 days prior to assist our staffing and supply requisitions. All participant registrations due 14 days prior, if not late fees apply. If a participant has an adventurous spirit and reasonably good health, he or she will be able to enjoy any of our programs. All teachers, chaperones, and students should respond fully and honestly to our medical questions on your registration form. However, please understand that although CFI will review participant’s information and may allow participation, it is a participant’s or parent’s (and in addition, in the case of school groups, school group personnel’s) responsibility to consider carefully, in conjunction with participant’s physician, whether a CFI program is an appropriate match for the participant, considering participant’s mental, physical and emotional condition – and fitness level. Note: We are often several hours away from medical facilities on our trips (and can be many hours away on multi-day trips). Participants need to bring a good supply of all medications and pack them with good protection. While we are not able to offer, nor promise fully customized meal plans for individuals in a group, we will try to accommodate special dietary needs and restrictions where practical. In some cases, individuals may be required to bring some of their own supplementary food. CFI can now cater to vegetarian, vegan, dairy free, gluten free, etc., and will consider other dietary requests. This information needs to be provided during individual registration of students. Do not refuse to follow any reasonable directive from an instructor. We maintain a zero tolerance policy for those who break the rules: parent and/or guardian and school administrator will be notified and the participant will be removed from the program as soon as possible, and at the expense of the parent/guardian. CFI instructional staff may base their determination that an infraction has occurred on evidence that was reported to them but not directly observed by them, or on the behavior that results from the infraction. CFI operates facilities and trips as smoke free environments in all buildings, boats, vehicles and common areas in campsites. No alcohol is allowed on school trips including college trips. On all CFI trips, we provide the chance to be “unplugged” from society, to experience the wilderness on its own terms, and to encourage enjoyment of natural sounds and quiet. We request NO electronic devices such as radios, CD players, cell phones etc. The exception to this is photographic and video equipment. EQUAL OPPORTUNITY: CFI provides equal opportunities to all, and does not discriminate on the basis of race, color, gender, religion, national or ethnic origin, sexual orientation, age, or disability. Or call us today: 800-860-5262. We’ll make it as easy as possible! Relax, and know that CFI will have terrific instructors, great food, and smooth logistics waiting for you when you arrive. Principal Melinda Snow, Grand County, Utah, Middle School.